Corporate wellness programs are sprouting up all over for quite a few major businesses and companies. Smaller firms are also instilling types of these programs as well. They started to become introduced in the mid-90s with companies starting their own wellness programs. Since then, more and more businesses have established wellness programs that have benefitted their company. There are literally hundreds of good reasons for incorporating a wellness program in any type of business. All wellness programs are a bit different. They can include exercise classes and programs for employees to participate in. There may be weight loss competitions offered with cash rewards and prizes. The company may present educational workshops on becoming a more healthy individual. Free memberships to local gyms can be handed out to participating employees. Quit smoking seminars may be held for those employees that need it as well. Let’s take a look at some of the top reasons for employees participating in a wellness program. According to the Organization for Economic Cooperation and Development (OECD), the United States is the fattest country in the world. The obesity rate for people 15 and over came in at 38.2 percent. The OECD estimates that by the year 2030, about 50 percent of Americans will be considered obese. This should be alarming for anyone living in the United States. Employees entered into the corporate wellness program do not have to become triathlon winners or fitness models. The Olympics do not have to be knocking at their door. They just have to become healthier than they already are. In essence, they are only competing against themselves. There will be a bit of competition in the company during a wellness program, but competition is not a bad thing. Competitiveness breeds success, whether in the fitness world or the business world. 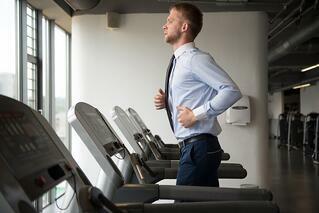 A corporate wellness program can offer a variety of health care plans. There are exercise programs, gym memberships, nutritional help, and possible medical advice that can be issued to the employees. A healthy employee translates to a more productive employee. They call in sick much less and are generally more active. Illnesses are less frequent with a healthy and energetic employee. It is amazing what eating better and exercising can do for a person’s quality of life and productivity. Reduction in sick days translates over to the company saving money. Absent employees can cost the employer quite a bit in the long run. If the employee is at home, they are not producing anything for the business. A healthy employee is a productive employee. Implementing a consistent wellness program is effective in reducing a company’s healthcare costs. Losing weight or quitting smoking can save a person serious money on their health insurance premiums. Now multiply that by the number of employees at the company, and everyone associated with that plan will see a decrease in their health insurance premiums. Everyone will be saving money! According to a study completed by Towers Watson and the National Business Group on Health, organizations with effective wellness programs report much lower employee turnover. A corporate wellness program encourages employees to share more of their lives with one another. A friendly family atmosphere can be created over time. When people work with a company that cares, they are less apt to leave them. An education finance firm, Nelnet, asks all their employees that are leaving what they will miss most about working for their company. The number one ranked answer is the company wellness program. Employees who take part in a corporate wellness program are happier in their jobs compared to people who did not, according to the AFLAC 2012 Workforce Report. There is a simple reason for this. While everyone understands that living a healthy lifestyle can make you look good, but it also makes you feel good. Healthy living can actually make a person happy. In a society where people go and speak to their doctor about trying to find a magic pill that will make them happy, the reality is exercise can boost a mood and improve an outlook on life much better than any prescribed medication. Money, Money, Money, Money! Moneyyy! A successful wellness program saves everyone money. Employee health care costs can shrink year by year, and employers will be pocketing savings as well. The popular company Johnson & Johnson has their own corporate wellness program. They estimate that the number of employees who smoke has dropped by two-thirds. The amount of employees that have high blood pressure or are physically inactive has dropped by fifty percent. That is all well and good, but how much money has it saved Johnson & Johnson? Just in the past decade, they estimate that it has saved their company $250 million on just health care costs alone. That does not even take into account the higher productivity that a healthy employee demonstrates compared to someone that is unhealthy with medical issues. According to the National Council on Health & Fitness (NCHF), there is a great return for companies that invest in quality corporate wellness programs. The company can save $358 per employee every year on health care costs. They will also save $294 per employee every year on absenteeism. It does cost the company about $144 per employee every year to run the corporate wellness program though. Still, that is about a $6 return on every one dollar spent on the wellness program. A business investing in a wellness program will realize that their money is well spent. An employee is always representing the professionalism of their company. Yet to a degree, they are portraying the qualities of their employer to others while they are not even at work. Appearance is everything while portraying a top corporation or business. The old saying goes that you never get a second chance to make a first impression. As bad as it may seem, it is factual. Obesity is something that is frowned upon. Snap judgments are made, true or not, about people that are grossly overweight. Obese people can be deemed lazy and unable to take control of their own health. Are these employees the best representation of a successful corporation? A quality wellness program is holding people accountable for their own health, and providing them with knowledge on what it takes to become healthy. In doing so, the employees’ appearance will become more of a professional impression upon others. There is a saying in fitness that talking creates energy. This can be seen on a football field, a basketball court, and definitely in fitness classes. There is a reason that there is so much chatter in sports. It generates more and more energy and excitement. Just enter into a kindergarten classroom sometime in the near future. When the little kids are talking and communicating, the classroom can be quite hectic. The enthusiasm is contagious! This is completely true in the business world as well. When there is open communication between employees with discussions and ideas, the liveliness in the room creates more and more excitement. The majority of the time, there is much better correspondence between people with similar goals. A corporate wellness program brings employees together that might not have conversed otherwise. Employees become cheerleaders for one another, offering encouragement when progress is being made with their fitness goals. This will translate over into work areas as well. Relationships will be formed that would not otherwise have been without a wellness program. A sense of community will encompass the corporation because of the common goal of living a healthier lifestyle. For those that workout or hit the gym regularly, you know that your fitness friends quickly become your best friends. They are with you during your best and stick with you during your worst. There’s no better feeling than walking into a gym and looking around at all the great friends that you have made in such a short amount of time. It’s amazing how quickly they become the friends that you hang out with the majority of the time, whether it be at the gym or outside of it. A corporate wellness program inspires all of this. With everyone partaking in fun fitness activities, a sense of enjoyment will spread across the entire workforce. Contempt for fellow employees can quickly change over to respect when discussing fitness goals. Soon employees are training together and having fun away from work, and that only strengthens their bond at work as well. A company-wide 5k run through a corporate wellness program activity can bring more laughter to the business than at anytime before. Healthier employees are happier people! If your corporation has not yet began a wellness program, now is the perfect time to proceed with one. The amount of benefits cannot be overlooked when creating healthier employees. Implement a program as soon as possible, before your company is facing problems. It will save money for both the employer and employee in health insurance premiums. These savings in health care costs will quickly add up to serious money. A healthier employee is a more productive employee. They will miss less days and be more active when they are at work. The National Council on Health and Fitness stated that for every one dollar spent on a corporate wellness program, that company will save six dollars in return. It really shouldn’t be given a second thought. If your company has a wellness program, participate in it. If they don’t have one yet, ask for one. Remember that the United States is currently the most obese nation in the world. Become part of the solution instead of part of the problem. Your health and your business will thank you!